Mimesis, the notion that art imitates reality, has long been recognized as one of the central ideas of Western aesthetics and has been most frequently associated with Aristotle. Less well documented is the great importance of mimetic theories of literature, theater, and the visual arts during the Renaissance and the Enlightenment. 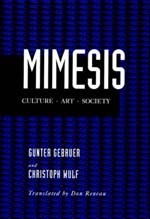 In this book, the most comprehensive overview of the theory of mimesis since Auerbach's monumental study, Gunter Gebauer and Christoph Wulf provide a thorough introduction to the complex and shifting meanings of the term. Beginning with the Platonic doctrine of imitation, they chart the concept's appropriation and significance in the aesthetic theories of Aristotle, Molière, Shakespeare, Racine, Diderot, Lessing, and Rousseau. They examine the status of mimesis in the nineteenth-century novel and its reworking by such modern thinkers as Benjamin, Adorno, and Derrida. Widening the traditional understanding of mimesis to encompass the body and cultural practices of everyday life, their work suggests the continuing value of mimetic theory and will prove essential reading for scholars and students of literature, theater, and the visual arts. Gunter Gebauer and Christoph Wulf are Professors in the Center for Historical Anthropology at the Free University of Berlin and the authors of several works of literary and cultural criticism. Don Reneau is a translator and writer in Berkeley, California.